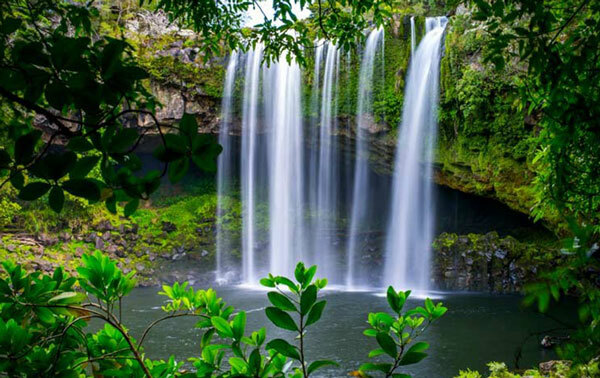 The Rainbow falls in Kerikeri is very easy to access. It is located down the end of Rainbow Falls Road. A leisurely five minute drive from the centre of downtown Kerikeri. It is well signposted and there is plenty of parking at the top of the falls. The falls can be viewed with only a short stroll from the carpark, with lookout locations at both the top and bottom of the falls. The top of the falls can be accessed by wheelchair, and there are toilet facilities at the falls. For the nature loving traveller with a bit of time on their side is the beautiful Rainbow Falls trail. It starts at the afore mentioned carpark and follows the river through beautiful native bush including young Kauri and Totara trees. It passes the historic Kerikeri Hydro-Electric Station and some very beautiful rock formations (formed from volcanic activity approximately 200,000,000 years ago). There is also a popular swimming hole below the Wharepuke falls which are also on the trail. The track is well made and there are plenty of rest areas along the way. The trail leads down to the Kerikeri Basin Recreation Reserve, where you can feed the ducks and picnic whilst enjoying watching the kids swim near the stone store. I would recommend you wear sturdy walking shoes, and take a bottle of water with you.